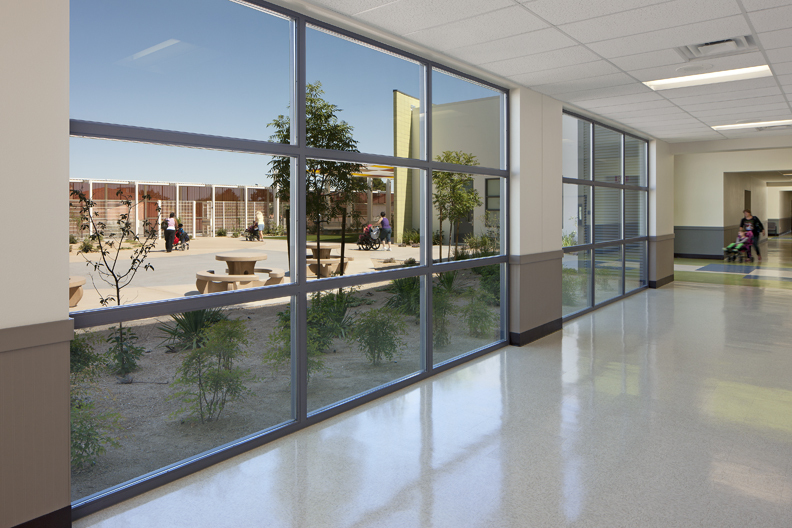 In collaboration with CORE Construction, Tate Snyder Kimsey was awarded the first design-build school for Clark County School District. The new 68,875-square-foot John F. Miller School replaced an existing facility that serves a special needs students. As characterized by the district, the John F. Miller School provides special education programming and services for students with specialized needs ages 3 to 22 years. The staff upholds that all students have the ability to learn and as such, we believe that all spaces have the ability to teach. All students have individualized education programs that reflect their unique and specialized needs. To foster this educational environment as the instructional needs of these students continually evolve, the building offers spaces for such learning to occur. The facility presents a variety of learning environments for the students to engage throughout. Each classroom allows for highly flexible layouts, providing the staff with unique opportunities to participate in a wide-range of teaching environments. Unique to the school is a centralized health center which provides medical assistance to each student’s specific needs. This component allows for a unified experience supporting both education and well-being. A series of exterior courtyards interrupt the building mass, yielding areas of refuge and exploration.